I volunteered to provide this week’s flowers for the front of the church this morning, so as usual I stopped by the supermarket to pick something up. None of the cut flowers called to me. It seemed too early for tulips, too late for mums, and the usual Alstroemeria or mixed bouquets were just too boring. The truth is I was wishing for garden flowers. It might be January but I was nevertheless dreaming of peonies, zinnias and hydrangeas. Although these are available as cut flowers somewhere, for some price, what I truly wanted was to pick them from my yard. Which is impossible. Interestingly, what was also impossible ten or fifteen years ago is now commonplace: tropical orchids, available almost all year. 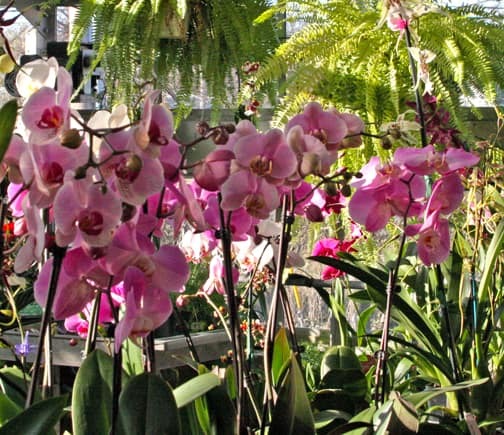 In the garden centers and supermarkets you can find a great selection of all types of orchids in full, luscious bloom. I bought two Phalaenopsis, stuck some curly willow behind them and called the arrangement done. They were stunning, with very little effort on my part. The person who took them home after church will find that they stay in flower for a long time and even produce new blooms from the old stem. All this for under $20. This was a reminder that although we can’t always have what we want, this is often a good thing. There are frequently alternatives that open doors, minds and hearts, leaving us glad that we’re forced to look further. I always look for plants that have a combination of open flowers and buds on them, but frankly, even if the plant you buy is in full bloom you'll enjoy it for a long time. Don't cut the stem off completely on these orchids - they usually produce a new flower spike from the same stem over time.